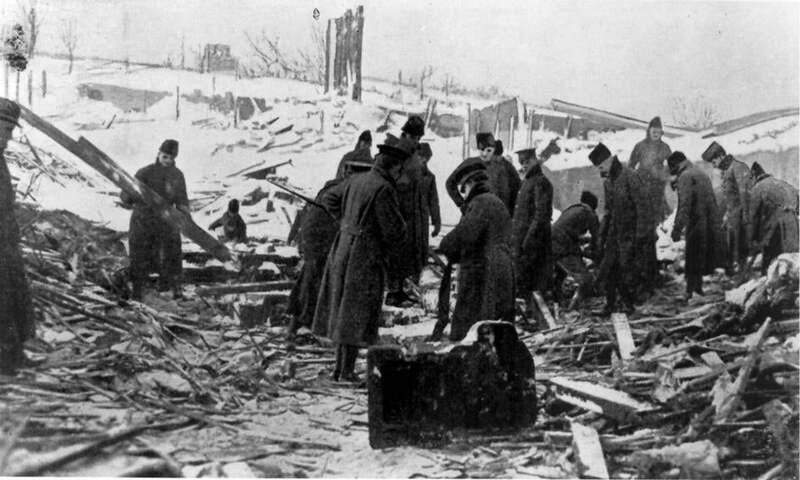 Soldiers search the debris for victims after the Halifax explosion on Dec 6, 1917. Every winter, the people of Nova Scotia send the province’s best Christmas tree to Boston Common. What did the people of Boston do to inspire Nova Scotians to spend some $180,000 each year to give them a 50-foot spruce tree? The answer lies in a forgotten disaster. On the morning of Thursday, Dec. 6, 1917, the captain and crew of a French munitions ship called Mont-Blanc were eager to reach the safety of Halifax Harbour, and with good reason. Five days earlier, a crew of stevedores in Brooklyn finished loading her with a staggering 6 million pounds of high explosives — 13 times the weight of the Statue of Liberty. The touchy cargo was headed for France, where it would be packed in shells and used against the German army to break the Great War’s three-year stalemate. A Norwegian relief ship named Imo was just as eager to go in the opposite direction to New York to get supplies. At Halifax Harbour’s narrowest stretch, the impatient Imo passed several ships on the left, against nautical convention, which set it on a collision course with Mont Blanc, hugging the shore. In this high-stakes game of chicken, Mont-Blanc bailed first, pivoting to the left at the last second — also against nautical convention. This would have worked — if Imo hadn’t lost its nerve and steered to the center at the exact same moment. At 9:04:35, Mont-Blanc erupted, leveling almost half of Halifax, rendering 25,000 people homeless, wounding 9,000, and killing 2,000 more — all in one-15th of a second, less time than it takes to blink. J. Robert Oppenheimer later calculated the first atomic bomb would be only five times more powerful. 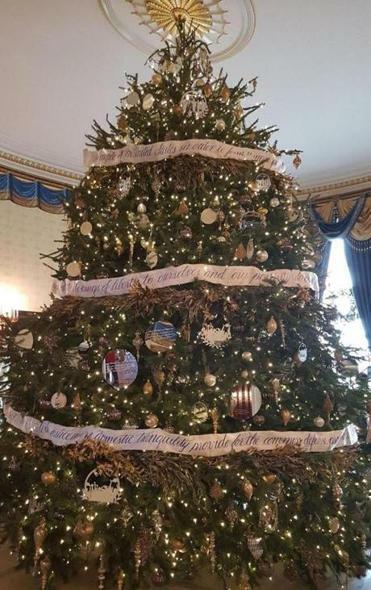 Ted Clausen hand-lettered the Preamble to the Constitution on a ribbon that wrapped around a Christmas tree in the White House. At 10:13 a.m., Boston’s leaders received a brief telegram about the tragedy. It was hard to predict how they would respond. On the one hand, the Revolutionary War pushed some 30,000 United Empire Loyalists from New England to Nova Scotia with hard feelings. During the War of 1812, one of Nova Scotia’s favorite sons, Joseph Barss Jr., returned the favor by capturing, sinking, or burning more than 60 American ships, making him the most wanted man in New England. During the Civil War, Haligonians helped a notorious Confederate battleship, the Tallahassee, sneak past Union ships under cover of darkness. For the Americans’ part, when the US Speaker of the House took the floor of Congress in 1911 to advocate annexing Canada, Massachusetts’ representatives didn’t raise a peep. They had even come close to doing the job themselves a few times over the previous century. Then there was the simple matter of identity: this was Halifax, Nova Scotia, not Providence, R.I.; and British subjects, not fellow Americans. But these two shipping towns had more in common than most. Boston was home to thousands of Halifax cousins and transplants, including James Ernest McLaughlin, who designed Fenway Park. It helped that in April 1917, the United States finally entered the Great War, becoming allies with Canada for the first time. Plus, Boston had just created something no one else had, a Committee on Public Safety, for disasters like this. While waiting for a response, McCall gathered the Committee on Public Safety at Faneuil Hall, where a hundred leaders formed the Massachusetts-Halifax Relief Committee and organized a relief train to leave that evening. The stoic official could not hide the tears streaming down his face. “Just like the people of good old Massachusetts,” he said. The Christmas spruce keeps saying ‘thank you’ to Boston, 100 years later. Joseph Ernest Barss, the great-grandson of Canada’s deadliest privateer, had been wounded in the Great War and returned to Nova Scotia to recover. When Mont-Blanc exploded, he put his first aid experience to use for three sleepless days before being relieved by medics from Boston. In the 1920s, Canada opened official diplomatic relations with the United States, and has been our nation’s biggest trading partner for decades. On November 30 this year, the people of Boston will light the Christmas tree, a testament to a time when the worst the world could inflict brought out the best in two countries. The hard-earned friendship those days forged has stood as an example to the world for a century.